'Doctor Who' monsters 'invaded' the Royal Albert Hall in London on Saturday night (24.07.10). Daleks, Cybermen, Judoon, Silurians, Weeping Angels and the Vampires of Venice all 'attacked' the historic concert venue as it played host to the 'Doctor Who Prom' - a performance of music from the last series of the BBC sci-fi show. Fans young and old - many of whom were dressed in bow ties and tweed jackets like their hero The Doctor - gasped in astonishment as the alien invaders walked through the audience looking for their archenemy. The concert featured music composed for the TV show by Murray Gold as well as several classical favourites, including Gustav Holst's 'The Planets - Mars' and Richard Wagner's 'The Ride of the Valkyries', and was performed by the BBC National Orchestra of Wales - who record the soundtrack for the series. The London Philharmonic Choir also accompanied the orchestra on several songs. Before the musicians played 'Battle in the Skies', from the 'Doctor Who' episode 'Victory of the Daleks', a camouflage painted Ironside Dalek rose from the floor in the middle of the audience was stood and offered fans "a cup of tea". 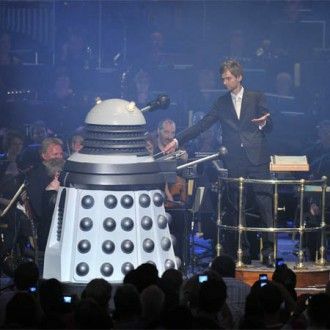 However, a white Supreme Dalek then made its way onto the stage and ordered its counterpart to "descend or be exterminated" and then ordered conductor Ben Foster to play the "theme of the Daleks or be exterminated!" The Doctor - played by Matt Smith - also made an appearance to huge cheers after the interval 'saving' everyone in the building from a bomb with the help of a young fan called Ellis. The concert was hosted by Karen Gillan and Arthur Darvill, who play companions Amy Pond and Rory Williams, and Smith also later took to the stage - which the TARDIS had landed on - out of character to introduce some pieces. The evening was closed by a performance of the show's famous theme song - with Gold joining the orchestra on keyboard - and another 'invasion' by the Cybermen and reptile-humanoids the Silurians.